A great hostel to stay in with a bar and good selection of drinks. Great pub games such as pool and darts which they weekly tournaments to get involved in. Pub is attended by locals who are friendly and want to have a good time. A party atmosphere. Several large screens here to watch sports especially football. Staff are very welcoming and friendly. Kitchen is clean and well equipped and very clean. We've been at N8 for two nights and that was nice, staff was kind and polite, always helpful. Price was very good for us, the room was nice and quiet and our beds smelled fresh. In the room you have one little locker per bed and some odditional open space in the room. You can also have other facilities if you pay a little more (not much). The kitchen was big and clean, you can store your own grocery in the fridges and cook it when you want. Toilets and bathroom were always clean. Very nice and friendly staff members. The only one issue I had, one of the guy was very unrespectfull he was all the time slamming the door like over 5 times in the middle of the nights, he didn't care about anyone, he was also switch on the light around 2am and left on, after he just gone...and every day the same..he had diffrent double bed, but he all the time crash with mine which woke me up...I hope in the future we can do something with those kind of people. 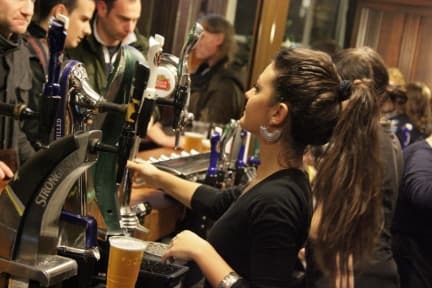 It's a good place to stay if you need to bunker down in London for a while - the location can be a bit of an issue but the staff are great, the pub is good and they put a fair amount of effort into keeping it clean. Good value for money. Having said that, don't take the 16 mix - the 20 mix is good if you don't mind people but the 16 mix is a dark, stuffy and depressing room. The Hostel is near the underground ( 5 minuti to walk) and there are a lot of market. The place is perfect. My room was clean and also the shared bathroom. The boy and the girl at the reception have been more welcoming. All in all a good stay. There are some minuses but you get what you pay. People sleep in your bed.